Description: A new title from one of Australia's leading author-illustrators, Stephen Michael King. A beautiful, affirming story for every family! 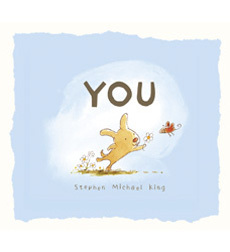 The perfect book to share with a child, parent, friend, or any special person in your life, You is a simple yet extremely touching story about how it is the people we love who make the world a beautiful place. Jake's Review: This book is for babies but its kinda cute. I think its more for mommies because they like that mushy stuff. I would like the illustrations to be done on the whole page, not just the little bit on each page. I also think there should be more words -- but I guess that is why the book is for little guys like my dumb brother who cannot speak much. Jesse's Review (done in mommy words): Likes to look at the cover and will let me read him a couple of pages and than he takes off. That is pretty good for Jesse as he is an anti book type of kid. I think he would really like this type of art if it was of something of interest to him like sports, cars -- or even better diggers. I cannot tell you what he thought of the whole story -- because -- um -- he wouldn't let me finish reading it. Mom's Review: I adored the art in this one. So sweet and beautiful and I think will really appeal to little girls - I know its sexist, but I have 2 boys and they tend to gravitate towards more bold and colourful. That being said I think little ones will enjoy the simple touching story and the cute little pictures. I will be passing it on to my friend Pam because I think her little girls will like it. I tweeted this review, but didn't know if you had a twitter acct.